The Waller 880 Catamaran has been designed specifically to fill the role of a family coastal cruiser. 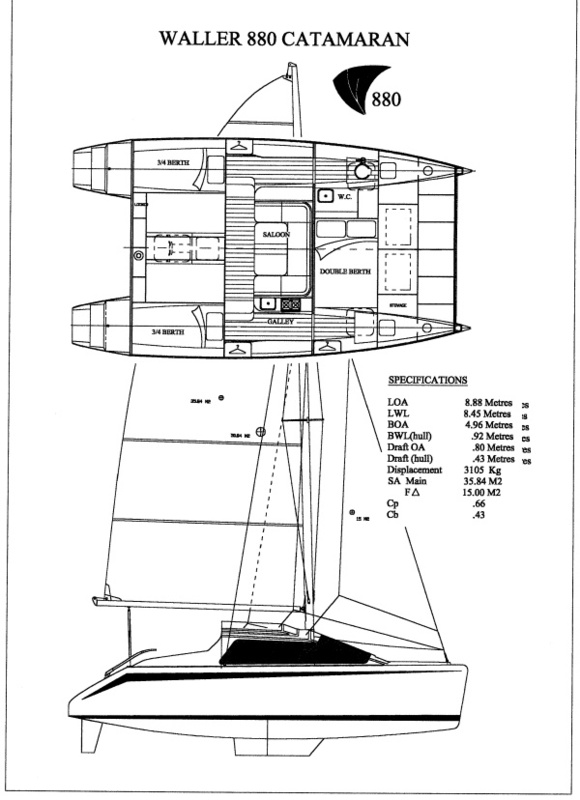 The hull shape, rig and accommodation layout have all been designed with this objective. HULL SHAPE: The hulls of the 880 are semi circular in cross section, deepening slightly towards the bow to minimise slamming in a chop, and flattening slightly to the stem to minimise 'hobby horsing' and promote planing. This follows accepted and proven principals in catamaran design, with no surprises or radical design features, and is in keeping with the safe family cruiser philosophy of this yacht. Resistance to leeway is provided by either short, shallow fin keels, or daggerboards. Although the debate of keels versus centre boards rages ever onward, the keels have many advantages for both family and cruising boats. There are no boards to be raised and lowered constantly, less chance of structural damage if you run aground, no C/B case blocking up the accommodation, you don't need complex kick up rudders and you can dry the boat out on the keels to allow under hull access for inspection and/or maintenance. Stub keels are quite efficient in reducing leeway if correctly designed. The plans also allow for daggerboards, however it is recommended this option be used only if it is intended to race the boat, and only in conjunction with kick up rudders, which are also allowed for in the plans. The hull length to beam ratio is as low as practical in this style of boat, and the displacement to the normal datum waterline has been designed to allow a reasonable standard payload for all the cruising gear that seems to come aboard and never leave. The wider hulls also allow extra gear to be carried without pressing the boat too much into the water, a common problem with narrow hulls. Extra weight will depress the hull below the load waterline by a rate of 1 cm for every 116 Kg. Payload includes only crew and personal gear, liquids and stores, and the anchors and motor, as all standard operation gear has been included in the dry weight of the vessel, including such things as galley fittings etc. The buoyancy characteristics of the hulls have been designed to minimise hobby horsing without unduly affecting the performance of the yacht. ting which can rot and has to be replaced seasonally for safety. While not commonly seen today, the full bridge deck is ideal for coastal cruising, and many boats of this type have safely and comfortably crossed oceans. Several have even completed world circumnavigation. The bridge deck has been given a minimum . clearance of 600 mm above the waterline with normal load conditions. This is excellent for a boat this size while still retaining reasonable bridge deck accommodation with good (sitting) headroom. In addition, the front edge of the bridge deck features a gentle slope up to the deck line at the front, unlike many small cats where the front of the bridge deck has been pushed out to squeeze in bunks, resulting in a steep, bluff rise forward which often leads to slamming and structural problems. The transition from hulls to bridge deck incorporates a flared panel. This is marginally more difficult to construct than the old fashioned square join of hull to bridge deck, especially at the front where it curves up, but it strengthens the hull, saves weight, reducing slamming under the bridge deck, and makes the world of difference to access into the hulls from the bridge deck. Experience has also shown that these flares assist the hull to lift over severe waves by picking up buoyancy as the wave travels between the hulls. The deck/cabin treatment utilizes a Coach cabin with narrow side decks. So often today you see boats in this size range where the bridge deck cabin is carried out to the sheer line, resulting in either a high, boxy look or reduced headroom in the bridge deck area. The cabin style of the 880 gives excellent headroom in the hulls, and with the smaller coach roof set back from the gunwales, excellent walking access forward without having to clamber over the top. The headroom on the bridge deck is 1.5 metres, and over 2 metres in the standing areas of the hulls. Again, these figures are excellent for a boat this size. ze. Bear in mind that many cats this size are slightly lighter, and are not really suitable for extended family cruising as they cannot carry the greater required payload. 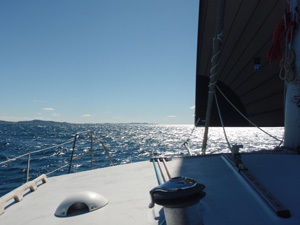 In addition, most cruising is done in light to moderate winds, in which case a good sail area means a sparkling performance. You can always reef down in heavy weather, but it is harder to add sail in light weather. CONSTRUCTION: Construction of the hulls is strip planked Cedar, sheathed inside and out in glass cloth and epoxy. The remainder of the vessel is constructed in marine plywood, with composite panels (Duracore, Coretech, Duflex etc) being an option for panel areas. The chosen construction represents the best compromise between strength, cost and simplicity of construction, and the strip planked hulls allow the use of efficient hull shapes without making construction too complicated for the amateur builder. Construction throughout uses the timber/epoxy principle, with the alternative of using linear polyurethane glues for the strip planking. ACCOMODATION: The 880 is designed for a family of four, but can sleep 6 if required. 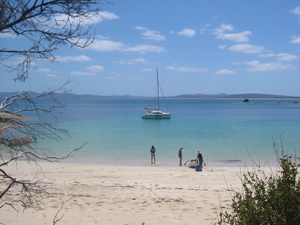 The accommodation features a full sized double berth in its own cabin, and two separate % sized berths aft in the hulls. Forward in the Port hull is a large 'bathroom' cabin, with WC, a vanity unit with sink and room for a shower. The center portion of the Port hull has a chart table area with more than adequate space. To Starboard, the centre hull area contains a large and functional Galley. On the bridge deck is a large dinette, with a table which drops down to form another double berth if needed. The Cockpit is enormous for a cat of this size, allowing ample room for day sailing and entertaining. PERFORMANCE: Since first launching, the 880 has proven to be a truly remarkable performer. She has proven capable and seaworthy in all weather conditions, and remains steady and easily steered in heavy weather. Her full bridge deck makes her a joy to sail in heavy weather, with a good, solid platform from which to work the boat, and significant increases in buoyancy forward which prevent her from burying her bows. The WaIler 880 has on several occassions clocked up daylight daily runs in excess of 80nm(over about a 10 hour period), and has recorded a timed run of 18 nautical miles in 90 minutes. This is a family cruising boat, and high speeds are not the main design priority. These figures show, however, that the 880 is capable of excellent average daily cruising runs for a 28 ft boat. 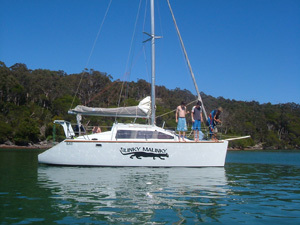 For pictures visit www.wallerdesign.com.au or read the Bass Strait Shakedown in "ARTICLES" on the home page.